Moving your business online feels like a huge undertaking. Where do you start? Check out our new Infographic for help and learn how eCommerce ERP can be your new best friend. Making changes to the way you do business—even though they’ll benefit you—can be stressful. This includes moving your business online. To help, we’ve created an Infographic providing the five major steps you need to take to make it happen. As an eCommerce ERP (and an omnichannel ERP), Acumatica can set you up with an eCommerce back-office system that synchronizes with your storefront website. 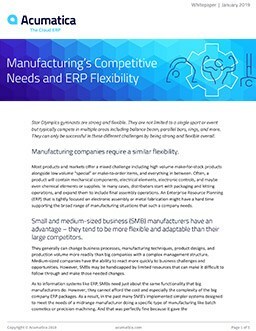 The Infographic below lists the benefits of embracing ERP capabilities. Acumatica customer Ray Allen Manufacturing chose Acumatica and Acumatica Commerce Edition—along with Kensium Solutions and the Kensium Magento Connector (which is a standard part of Acumatica Commerce Edition)—to handle their military and police canine equipment business management needs. With integrated eCommerce ERP capabilities, they’ve improved their customer service, streamlined their operations, and more. Learn more about how you can better integrate your eCommerce and ERP systems in our free whitepaper, The Best eCommerce Starts with Tighter Integration. If you’d like to learn more about Ray Allen Manufacturing’s success with Acumatica’s eCommerce ERP, check out their success story. If you’d like to start writing your own success story with an integrated eCommerce back-office system, contact our team and we’ll be happy to walk you through each step. How can I use Operational Efficiency as a Competitive Advantage in my Ecommerce Business?